Movin’ On Up … to the lower-risk-of-obesity side? Jens Ludwig, a professor at the University of Chicago, published a study titled “Neighbordhoods, Obesity, and Diabetes — A Randomized Social Experiment”, published in The New England Journal of Medicine on October 20, 2011. The study investigated the health affects of Moving to Opportunity, an initiative created to give single women (typically with children) in high-poverty areas access to housing in low-poverty areas. Group A: moved to areas with less than 10% poverty (Currently, the poverty level for a single mother with two children is about $17,500 per year.) , and were given vouchers so their rents did not change. Group B: could move anywhere and were given vouchers, so their rents did not change. Group C: did not move and were not given vouchers. Group C was the control group. These results mimic the impact of programs specifically designed to target diabetes and Body-Mass Index (BMI) through healthy eating and exercise campaigns. They also clearly demonstrate that environment can really affect health. These results would make it hard to prove that all who live in high-poverty areas choose (through “bad habits”) to have higher rates of diabetes and higher BMIs. Ludwig et al draw the conclusion that improving high-poverty neighborhoods could affect the health of those living there. When access to healthy food is increased and environments become safer, people can become healthier. Unfortunately, high-poverty areas are often “food deserts“, areas where mainstream grocery stores are absent or in short supply. The healthy choices in high-poverty area mini-marts are often peanuts or trail mix, not fresh apples or spinach. Greater access to high quality, healthy foods could certainly explain why the women who moved to low-poverty areas had lower rates of diabetes versus those who stayed. 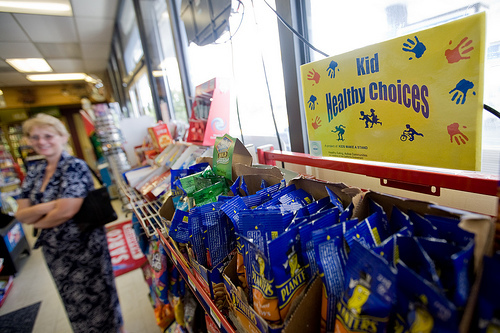 Food deserts might become less sandy soon, though! In July 2011, Walmart, Walgreens and Supervalu announced that they would team with Michelle Obama to open up new locations in food deserts nationwide. In the past 4 years, Walmart has opened up over 200 stores in food deserts. Collectively, the retailers are aiming to open 1,500 stores in food deserts to make healthier food options more affordable and more accessible. Personal responsibility so often gets assigned to those in our national community who are obese or have diabetes; it’s refreshing to have a research-based perspective on things that sheds light on another possible culprit: environment. Nature? Nurture? What came first: the tofu or the soybean (this is MUCH easier to answer than the chicken and the egg question)? It will be interesting to see what results from these retailers moving in! Watch Jens Ludwig discuss this study below!